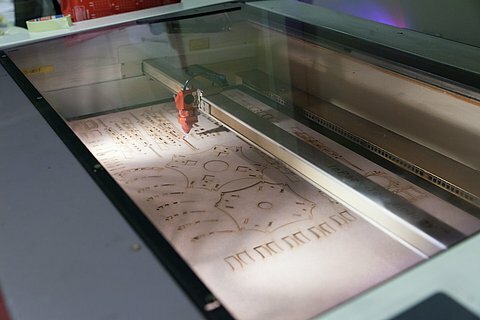 A laser cutter is a machine that uses a laser to cut materials, and is typically used for industrial manufacturing applications, but is also starting to be used by schools, small businesses and hobbyists. Laser cutting works by directing the output of a high-power laser, by computer, at the material to be cut. The material then melts, burns, vaporizes away, or is blown away by a jet of gas, leaving an edge with a high-quality surface finish. Industrial laser cutters are used to cut flat-sheet material as well as structural and piping materials. What can you do with a laser cutter? The laser cutter enables the user to cut materials and/or vector mark or raster engrave patterns into the surface of materials. It cuts on a 2D plane with the laser head (cutting point) moving in two directions (X & Y). The depth of the cut is dictated by calibrating the laser’s power and speed. If the power is reduced and/or speed is increased so the laser does not cut through the material it will then vector mark the line into the surface of the material. Cutting vector lines to create shapes with planar and curved edges. Vector marking lines/patterns into the surface of materials at different depths. Raster engraving fill areas at different depths to create patterns in the surface of materials. All three outcomes can be combined in the one job to create 2D shapes with patterns composed of vector lines and fill areas raster engraved at different depths into the surface. How to indicate the laser cutter what to do? The different outcomes in cut depth are achieved through the application of different power and speed settings to assigned ‘pen colors’. ‘Pen Color’ refers to vector line colors which the laser cutter software interprets as different power and speed settings. Each color can be associated with different settings to achieve different results. We use black only for raster engraving and red only for vector marking. Other colors are used for vector cutting. Colours are handled by the laser in the sequence as indicated in the below table. This enables control of the sequence in which the cutting operation is performed. Generally because of accuracy it is advisable to first perform the inner cuts before cutting the outline of the shape to be created because parts may change position. A wide range of materials are compatible with the laser cutter but some must be avoided for health and safety reasons and due to the density of some materials. All new materials should be discussed with staff. The cutting area of our laser cutter is limited to maximum 700 * 400 mm. We may have some leftovers from other materials. Other materials must be provided. Please keep in mind that the price of acrylic is about 10 times as much as the price of MDF. How to prepare files for the laser cutter? We use CorelDraw to open and process your files. CorelDraw can open or import a lot of file types including older versions of AutoCAD dxf and dwg, Adobe Illustrator ai, and eps Encapsulated postscript and pdf files. Scale. Draw on 1:1 scale on a 700 * 400 mm canvas or page. Keep some clearance on the edges. A few mm is sufficient. Colour. Use coloured lines (see above table) for cutting or vector marking, use black for raster engraving. Lay out. Lay out (nest) the various parts on the canvas or page in order to reduce material usage. Pay attention when sharing cutting lines, see next point. Shared lines. Be careful when parts share cutting lines: usually this leads to double lines meaning cutting twice (may lead to loss of accuracy, melting, burning, or warping of material). Delete redundant copies of lines! Especially pay attention when you use tiles built by using rectangles sharing sides. As an aid for removing duplicate lines in Adobe Illustrator you may decide to use the script WR-removeDuplicates available from this website. Sharp corners. If you have any sharp corners, you might consider rounding them (called "adding a radius" to a corner, or "adding a fillet") so your parts will be less likely to crack around the corners. Sharp corners can be made however when needed. Adjusting for removed material thickness. You may want to adjust for the kerf (the thickness of the laser beam), which is about 0.3 mm. The laser centers itself on the lines you draw and takes off about 0.15mm of material from either side of the lines. These numbers are approximate and can vary depending on the material and its thickness and corresponding laser settings. In CAD programs, this can be achieved using an offset of 0.15mm. It is advisable to make a few test cuts with different offset when you need this accuracy. Details. Small details should not be too small compared to material thickness, especially for thin materials. For thick materials the laser needs more power and the material might burn away. We can attempt to cut thinner pieces, but the part will likely warp and be very fragile. Also in this case a small test is advisable. Text and fonts. If you use uncommon fonts, text should be converted from a font to line art (often called "breaking apart text to lines or polylines" in CAD, or "converting text to curves" or “create outlines” in other drawing programs). Otherwise, if we do not have the font you are using, our programs will substitute your font with a different one. Alternatively you may decide to use single stroke fonts for cutting or vector marking. 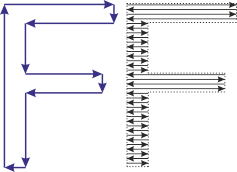 Raster engraving versus vector marking.Consider vector marking (shallow cut, not completely through material) lines, markings, outlines of text instead of engraving them as vector marking can be much faster for small markings compared to raster engraving. When raster engraving curves make them at least 0.2 mm wide (remember 0.1 mm is the thickness of a hair). The laser cutter is available only for ID staff, and ID master, ID PDEng, and ID PhD students and only for ID Education or ID Research related activities. Be aware of the maximum size 700 * 400 mm. Smaller is not a problem. Check the cutting sequence (colours). Remove all multiple lines (see above). Multiple lines means multiple passes of the laser which results in thick cutting lines and burn markings We will reject files with multiple lines. Cutting time required may vary between a quarter of an hour to few hours for jobs with a lot of lines and raster engraving (average is about ½ hours). We prefer to use vector marking instead of raster engraving because it is a lot faster. In the file name please include your name, the material (mdf – acrylic, own material) and thickness. Also indicate how you want to have the material cut. We try to save material by combining more jobs on a single sheet. If you don’t want this, please indicate clearly (e.g. centered on a sheet). 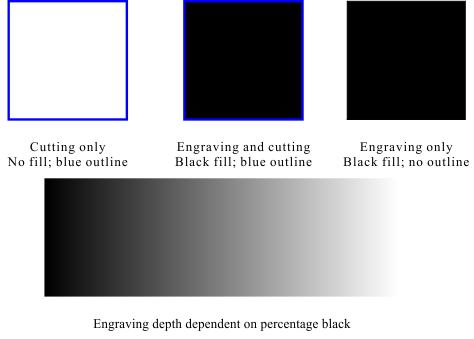 Also indicate what you want to do with black objects (raster engraving). We prefer if you submit your files through e-mail to lasercut.dsearch@remove-this.tue.nl. We experienced conversion problems with *.ai files in the file format of Adobe Creative Cloud, and sometimes in CS6 format. Please use one of the older CS formats e.g. CS4 instead. Generally files will be processed on first-come first-go basis, although staff may decide on deviations from this principle. You will receive an e-mail as soon as your job has been processed or in case of questions about your request so monitor your e-mail. You can find your job in the cabinet next to the entrance of LG 0.59.